As first appeared in the June/July 2010 edition of the Syracuse Astronomical Society newsletter The Astronomical Chronicle (PDF). Those in the vicinity of Manlius, NY are no doubt aware of the presence of Sno-Top (home of the best soft black raspberry in the area, IMHO) and the duck pond at town center(-ish). Those continuing just a tad further along Fayette Street (92, DeWitt-to-Cazenovia direction) also know that the swan population is localized to the higher pond near the Saucy Swan Restaurant (they do make for loquacious patrons). These facts, combined with the oppressive CNY heat of early July, made the choice of Cygnus the Swan obvious for this month’s constellation. 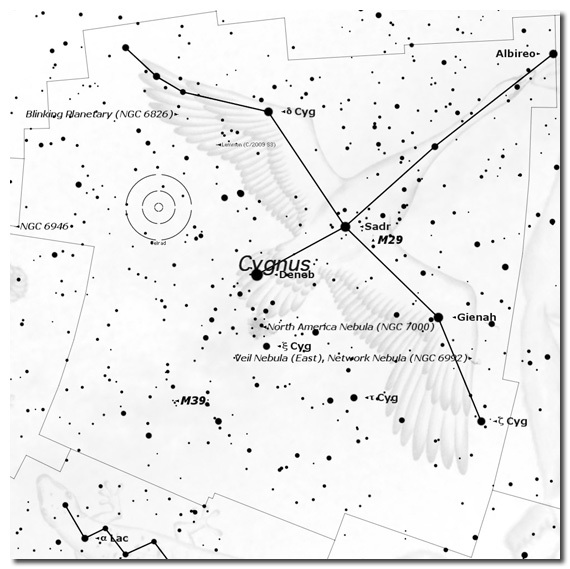 Fittingly, Cygnus is an astronomical feast for naked eye, binocular, and telescope observers alike and, as it is half-way between horizon and zenith in early July in the early evening, it is strategically placed for accessibility with all manner of optics. Cygnus is surrounded by several dangerous Constellations. The animal Constellations Draco, Velpecula, and Lacerta might enjoy freshly killed what the king Cepheus would otherwise enjoy glazed. The massive Constellation Pegasus is a problem in its own right. Trampled by horse is bad enough on the ground, but to have to avoid trampling by a flying one is another matter altogether. Lyra may be the only reminder to Cygnus of its terrestrial past, having been the instrument of choice for one of Cygnus’ human attributions (that man being Orpheus. See below). For those using only their free pair of 1×7 binoculars (that is, your pair of eyes), the cross that makes up the body and elbows of the wings of Cygnus are most obvious. The bright stars Deneb, Sadr, and Gienah (and the nearby Vega in Lyra, the easiest of the stars in this part of the sky to find starting at sunset) are perhaps most obvious, but the rest of the body is pronounced. As the evening progresses (and on reasonably clear nights), the most striking feature of Cygnus is the river of stars and interstellar dust that is our view of the Milky Way (as if Cygnus is flying above it). As a collection of prominent stars within the body of the Milky Way, you can guess that the Constellation we know as Cygnus has a long and distinguished history. The Greeks (“Give me a Constellation, any Constellation, and I show you that the history of that Constellation is Greek”) have many swans in their mythology, from Zeus (who fathered Gemini and Helen of Troy disguised as a swan, or so the story goes) to Orpheus (turned into a swan upon his death and placed next to his lyre (Lyra) to characters in Ovid‘s Metamorphoses. 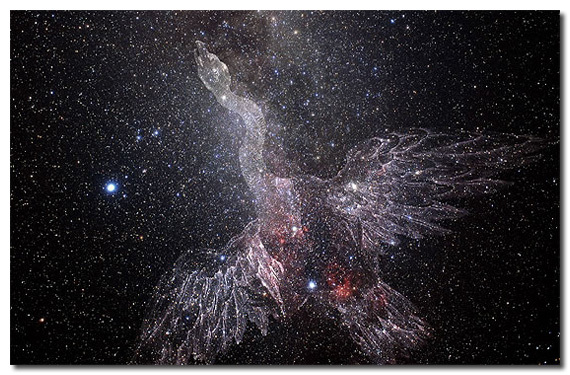 Cygnus is a member of the “Famed 48,” the 48 original Constellations contained within Ptolemy‘s Almagest. At the head of Cygnus is the star Alberio which, upon inspection with even low-magnification optics, resolves into two stars that make up quite possibly the best color contrast in the northern hemisphere (above, from wikipedia). Alberio A (the orange-ish one), is actually itself a true binary, meaning its two stars are gravitationally bound to one another. 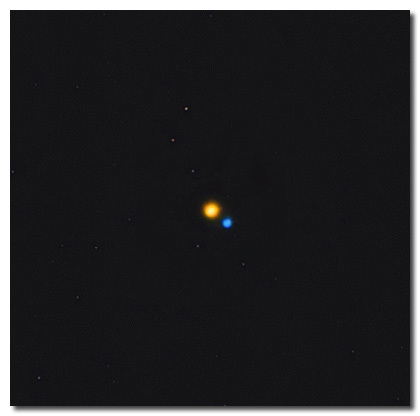 It is possible, with scopes larger than 20″ and under excellent conditions, to resolve the two stars, Alberio B (the blue-ish one), is a single star that is not gravitationally bound to Alberio A, making this most famous binary an “optical binary,” one where the two stars look very close but only because of our perspective from Earth. If Cygnus is out, this star always makes its way into the eyepiece of the 16″ scope at Darling Hill. Further, for those who like to get their scopes perfectly focused (especially large binoculars), this combination is an excellent test. As is the case with all of the Constellations within the band of the Milky Way, Cygnus is host to several binocular and telescope objects. 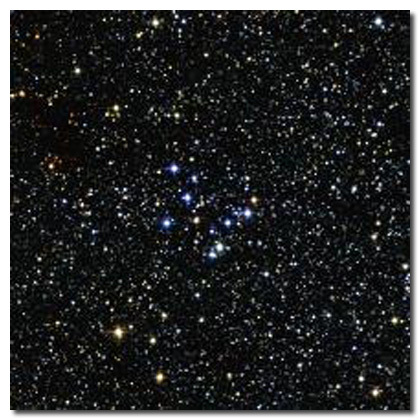 The two pronounced Messier Objects are M29 and M39, both open clusters. M29 (above, from wikipedia) is famous (to me) for being the one Messier Object that does NOT appear in the index of the Peterson Field Guide To Stars And Planets. Believe me, I have tried several times to find it (just assuming the dark conditions kept me from seeing it. It does appear in the Constellation map, though). This object appears within the binocular field of view of Sadr and is small but worth scanning in dark skies. 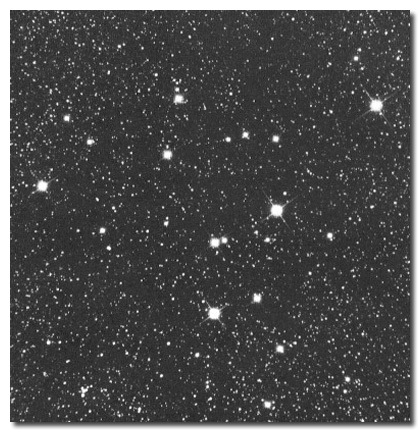 M39 (below, from seds.org) is similarly nondescript, residing between Deneb and the stars of Lacerta. 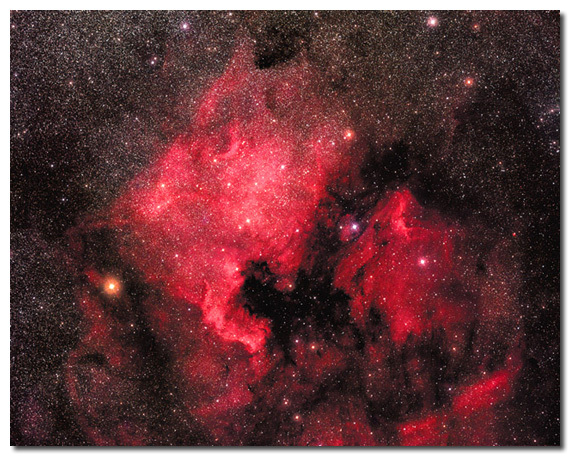 Cygnus becomes quite interesting for its wealth of interesting New General Catalogue (NGC) Objects. 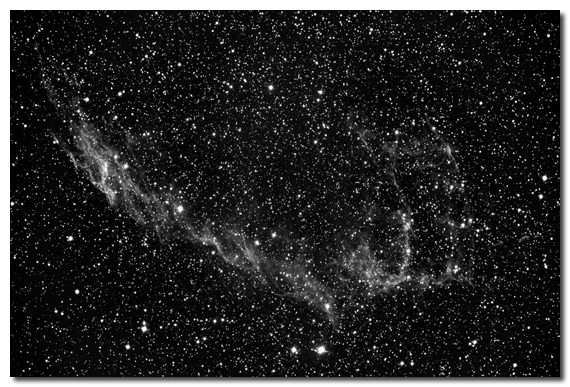 The four most prominent objects are the North America Nebula (NGC 7000), the Pelican Nebula (IC 5070), the Veil Nebula (NGC 6960, 6962, 6979, 6992, and 6995), and the Crescent Nebula (NGC 6888). The North America (not American) Nebula (below, with the Pelican Nebula to its right, from wikipedia) is a testament to the only mild imagination of the working observational astronomer. Like many nebulae, details can be pulled out of this object with the use of filters. Depending on the conditions, the best way to confirm this structure exists in your scope is, frankly, to move the scope ever so slightly in the field of view of nearby stars and confirm for yourself that some slightly darkened patch of sky is staying put with respect to the background of stars. This approach, combined with averted vision, is definitely my method of choice for finding the locations of objects I may otherwise miss completely (and we’ve all had the experience of NOT seeing something in a scope that another person can even make detail out of). The very low surface brightness of the nebula makes it an at-least binocular object to observe, but it is noteworthy that this entire North America Nebula is reportedly four times the size of the full Moon. The Pelican Nebula (lower right of the image above) looks more like a Teradactyl to me, but there is some similarity in both (in case you do not see it, the pair of eyes are at upper left (with a bright star in each marking the pupils), the beak extends to the left (and is narrower than a typical pelican), and the body extends to some less structured arrangement down to the lower right). The North America and Pelican Nebulae, photo by Jason Ware. From wikipedia.org. The Veil Nebula is a collection of nebulae that make for haunting photos. I am very pleased to have a greyscale image of the Eastern Veil provided by our own Stu Forster (below and in the member gallery). This object is very difficult to observe without an OIII filter, but even an 8″ scope will resolve the detail of this nebula with the filter (it is reported that in excellent sky locations, simply holding this filter to one’s eye will make the Veil Nebula stand out). The Veil Nebula has also been the focus of some considerable Hubble imaging time and a web search for these images is definitely worth one’s time. The Crescent Nebula. Photo by Stu Forster. 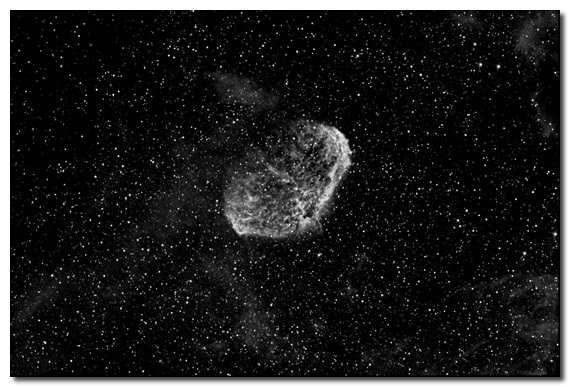 Finally, the Crescent Nebula has also been the focus of some astrophotography time by the good Dr. Forster (below (The Crescent, not Dr. Forster)), appearing to me more like a floating brain than a boring crescent. The Nebula is formed by a Wolf-Rayet star, a type of very hot, massive star with a strong stellar wind. This nebula is actually a double-whammy, as the fast-moving stellar wind from this WR star is colliding with the slower stellar wind from this same star when it was a red giant some 400,000 years earlier.